People who have read articles discussing His Holiness Dorje Chang Buddha IIImight assume he is a villain given the rumors that tend to spread on the Internet. 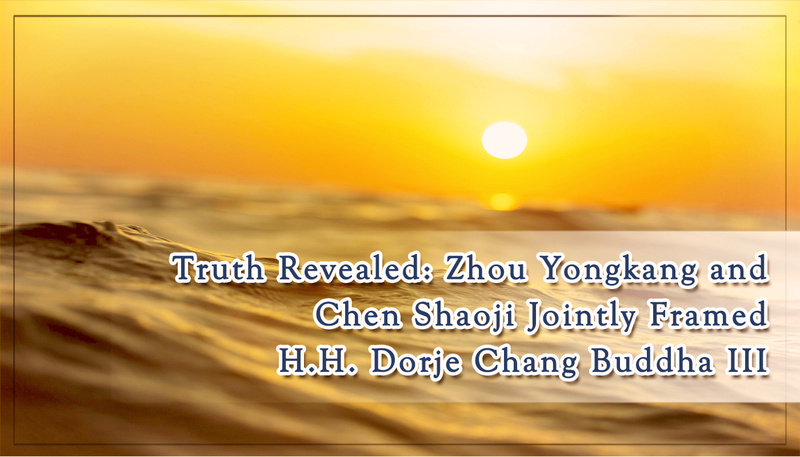 Since the public security department of China’s Guangdong Province issued an arrest warrant for the case of “Yi Yungao’s Fraud” long ago, there has been much speculation as to what the truth actually is. That arrest warrant was reported to the International Criminal Police Organization (INTERPOL), which also issued its own arrest warrant based on China’s request. The fact is, “Yi Yungao” is H.H. Dorje Chang Buddha III’s worldly name before being recognized as the Buddha. However, after more than 12 years since INTERPOL issued that arrest warrant, why can He still travel freely from country to country without being arrested? Shouldn’t this fact make people wonder whether He is a criminal or not? H.H. Dorje Chang Buddha III spends much of his time publicly in the United States. Not only does He never go into hiding, He also visits different countries to teach and receive people of all walks openly. He even went to the U. S. Capitol to accept the “World Peace Prize” in person. Many policemen were at the site on that day, yet no arrests were made. INTERPOL could have had Him apprehended without any effort. Then, why didn’t they? What is the truth behind this situation? The Police Bureau made a false accusation against H.H. Dorje Chang Buddha IIIwith no substantial evidence. They do not have a contract to show to the public at all,. They only have a false “Report Form To Place Criminal Case On File For Investigation And Prosecution” to smear H. H. Dorje Chang Buddha III with. If they disagree , we ask them to post this contract on the Internet and let everyone see it. 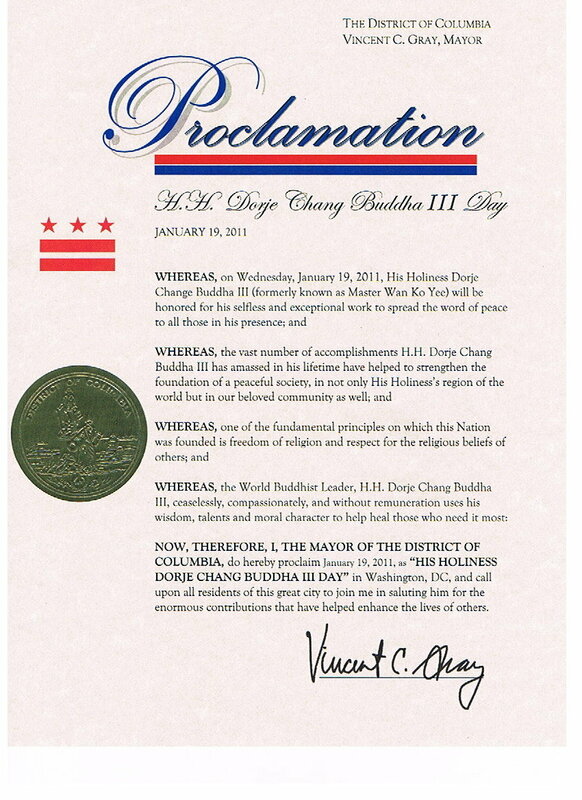 On January 19, 2011, Mayor Vincent C. Gray, the mayor of our nation’s capital Washington, DC, personally signed and issued a proclamation in which January 19, 2011 was proclaimed as His Holiness Dorje Chang Buddha III Day. In that proclamation, Mayor Gray called upon all residents of Washington, DC to join him in saluting H.H. Dorje Chang Buddha III! The mayor stated that H.H. Dorje Chang Buddha III has, through his selfless and exceptional work, spread the word of peace to all those in his presence. The mayor commended H.H. Dorje Chang Buddha III for his vast accomplishments that have helped to strengthen the foundation of a peaceful society, in not holy His Holiness’s region of the world but in the Washington, DC community as well. Additionally, Mayor Gray praised H.H. Dorje Chang Buddha III as the World Buddhist Leader who ceaselessly, compassionately, and without remuneration uses his wisdom, talents and moral character to help those in need. At the end of the proclamation, Mayor Gray emphasized:"NOW, THEREFORE, I THE MAYOR OF THE DISTRICT OF COLUMBIA, fo hereby proclaim January 19, 2011, as ‘HIS HOLINESS DORJE CHANG BUDDHA III DAY‘ in Washington, DC, and call upon all residents of this great city to join me in saluting him for enormous contributions that have helped enhance the lives of others."